MPC's Flexible Magnetic Labels and Decals can be attached to any metallic surface - even a surface that is slightly contoured - and easily relocated, repositioned or simply removed, again and again. This versatility and mobility make flexible magnetic labels a popular choice for light-to-moderate interior applications and short-term outdoor applications. Our flexible magnetic labels and decals have an expected exterior life of up to two years. Flexible magnetic labels and decals are ideal for use in inventory and asset management, equipment labels, vehicle decals and signage, scheduling boards, safety, warning and caution decals, and many more temporary labeling applications. 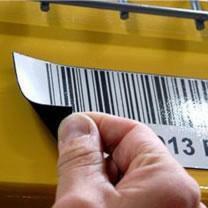 Why Choose MPC's Flexible Magnetic Labels & Decals? Easy to relocate, reposition or remove - again and again. Adhere to metallic surfaces, including slightly contoured surfaces. Crisp and colorful high-resolution graphics and copy printed on .024" (.015" optional) flexible magnetic stock. Offers moderate resistance to moisture, general purpose and household cleaners. Optional coatings for over-laminates may be applied for increased durability against exposure to general purpose and household cleaners, mild acids, oil and water. Expected exterior life is up to two years. Not recommended for long-term outdoor applications. Ideal for light-to-moderate interior applications and short-term outdoor applications. .024" (.015" optional) flexible magnetic face stock. Matte white. Optional gloss or matte laminates available.